I'm thinking of changing the way I post things on the blog. I have lots of projects in the works, and quite a few that are done and need to be posted, the biggest impediment being that there are lots of photos that need to be edited. I'm thinking that maybe if I made smaller posts I could make them more often. More frequent posts should mean more return visitors. Also, breaking a project down into smaller chunks and posting the progress shots as they are made might be easier than waiting for a project to be finished and then editing and collating all the pics and doing a big write up, then waiting for the next project to be finished. If you have an opinion as to which is better, bigger posts about completed projects, or smaller posts of projects in progress that come up more frequently, please leave a comment. So, to try out the new posting format, here is a little snip of a project that is currently in production and almost complete. 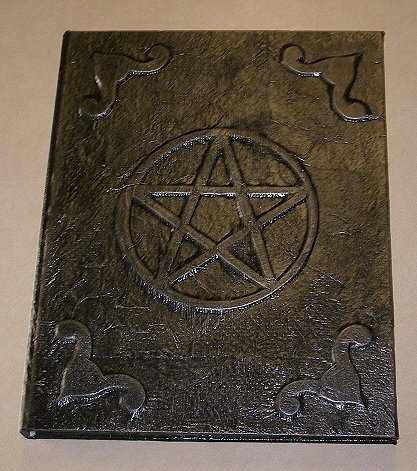 I have two copies of Cunningham's Encyclopedia of Magical Herbs, by Scott Cunningham, that were misprinted and unsellable, so I am re-covering them with a custom hard case to showcase some covering and materials options for potential customers who may want me to re-cover their books for them. As the original book was a paperback, it did not have a headband (that little tab of cloth wrapped with colored thread at the top and bottom of the spine). I have no sources for bookbinding materials in my area, and the pre-fabricated headband I found for sale over the internet is a bit expensive, so I decided to make my own. 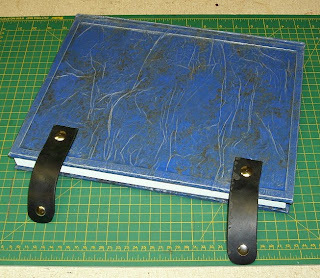 I started with a technique that I have seen mentioned on several websites and in a few YouTube videos (yes, people actually make YouTube videos about bookbinding techniques, and I thank them for it). I took a piece of black cloth, about 1.5 inches wide by 4 inches long, and coated one side with white glue. Then I laid a piece of black hemp cord (the kind hippies make bracelets out of) and laid it lengthwise across the middle of the strip of cloth, on the glued side. Then I folded the cloth over at the cord, and smoothed it down, using a bone folder to snug up the seal along the edge of the cord. Now, the websites and videos I saw just leave it there, and I could have too. You just wait for the glue to dry, cut a piece off of the strip to the length needed and glue it into place at the spine of the book before it is cased in. But this time I decided to go the extra mile. I decided to hand wrap the headband in colored thread to make it look nicer and more authentic. 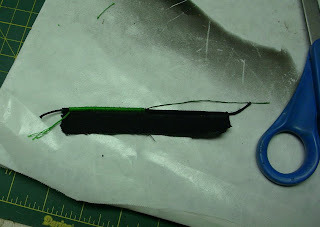 I used a forest green embroidery floss, which I had to thin by a few strands, and using a needle, I hand sewed the headband, piercing just below the cord and wrapping the thread around the cord for the length of the strip (or until I ran out of thread). It was basically simple embroidery, just like my mother taught me when I was 7. A little tedious and a little time consuming, but not difficult at all. 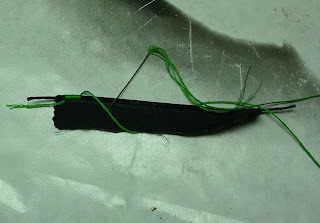 After I had sewn as far as I could, making sure my stitches were evenly spaced and tight, I ran a very small bead of superglue along the bottom edge of the embroidery, so that it would not unravel when the headband was cut to length. 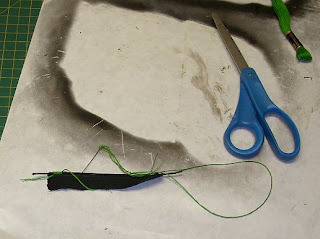 I think in the future I might try putting a light coat of white glue along the cord edge and wrap/sew the floss over it. That would do a better job, but it might be too messy. I don't want to gum up the floss with glue as I sew. 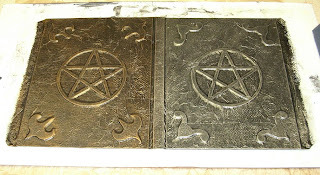 A few months ago, I had an idea to make a reversible book of shadows. What I mean by that is, it can be opened from either side (front or back). There is no distinct front and back cover. Either cover looks like it could be the front. 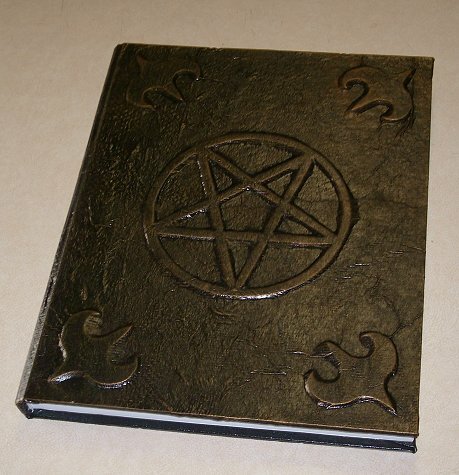 I designed it so that one side depicts an upright pentagram and has a silver finish, and if you flip it over it depicts an inverted pentagram, and has a bronze finish. I started with a large format blank sketch book (one of the ones I get for a song from a local discount store). 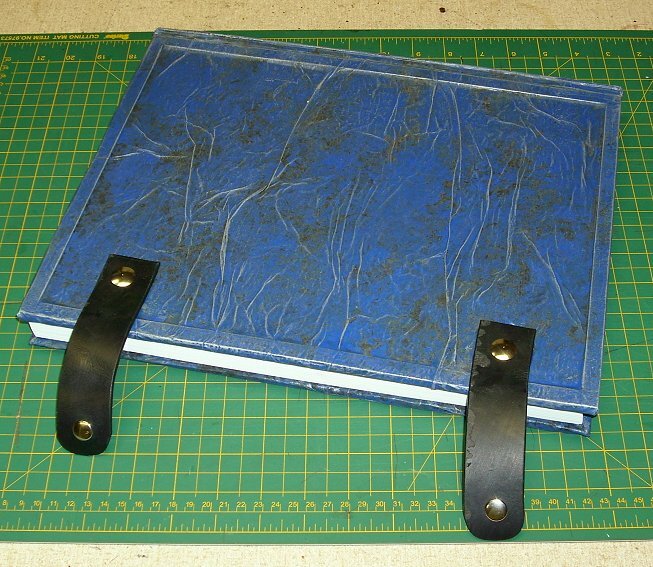 I reinforced the front and back covers, along with the spine, with some chipboard. The stock cover boards that it comes with are too flimsy. 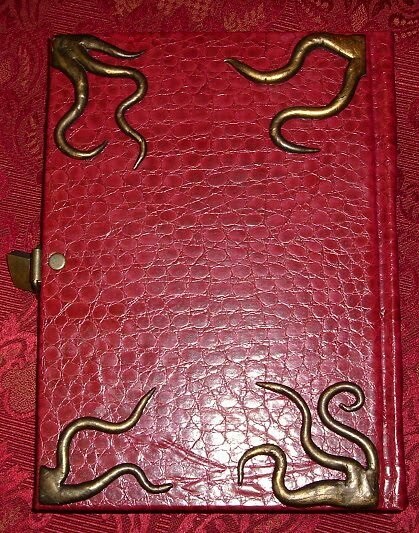 In addition to the reversible-ness of the book, I planned to experiment with a few other new techniques on this project. 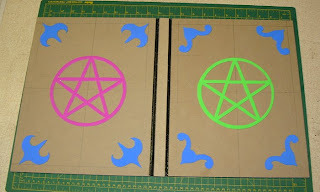 One new technique was the use of craft foam sheets in place of chipboard for my decorative elements. It is much easier to cut craft foam than it is to cut chipboard. 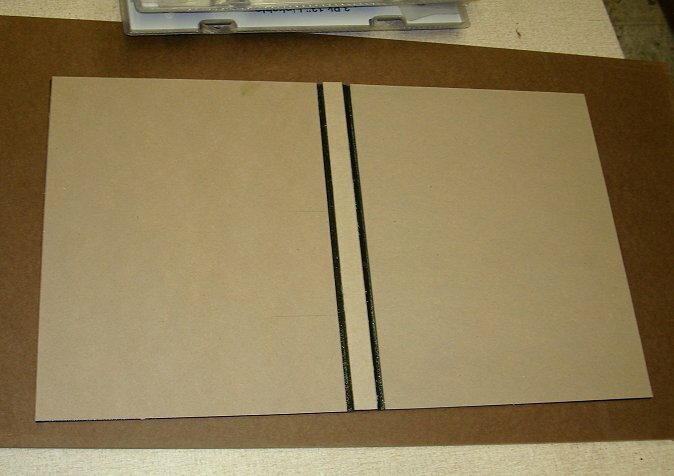 Even with a sharp hobby knife, chipboard is tough, especially when cutting tight curves. 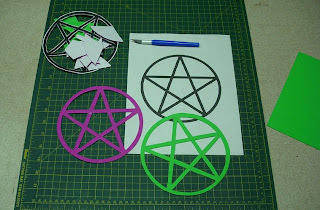 If foam sheets would make a suitable replacement, I could make much more complex designs and cut them much faster. 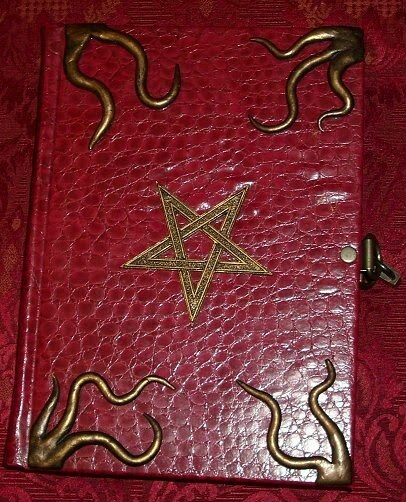 For this book, I cut out two pentagrams, one for the back and one for the front, and eight corner bosses. I made the front corner bosses a different design than the back corner bosses. 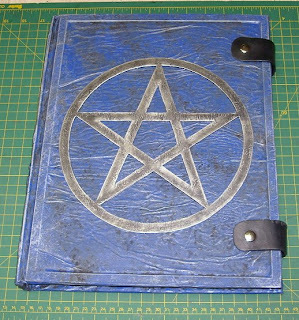 The ones that will be with the upright pentagram have a rounder style, and the ones with the inverted pentagram have a more pointed style. 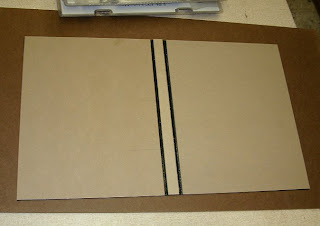 I worked out the designs on paper and then used spray glue to tack the paper down to a sheet of chipboard in order to make a template I know what you are thinking, I used a chip board template to avoid cutting the pieces out of chipboard. 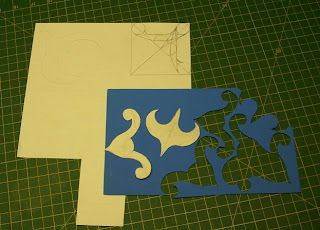 Believe me, cutting two templates out of chipboard is a lot easier than cutting eight production pieces. 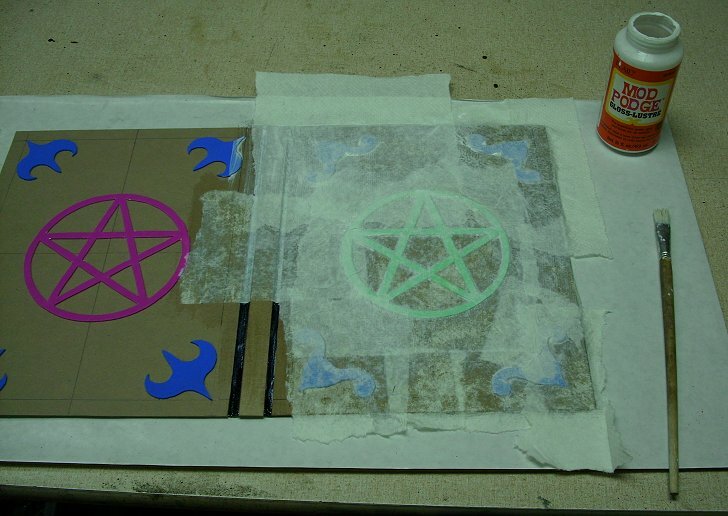 For the pentagrams, I just spray glued the paper directly to the foam sheet. 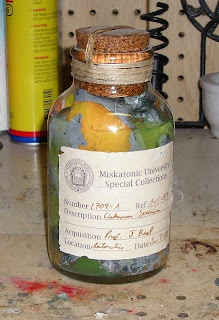 The other experimental technique was the covering material. 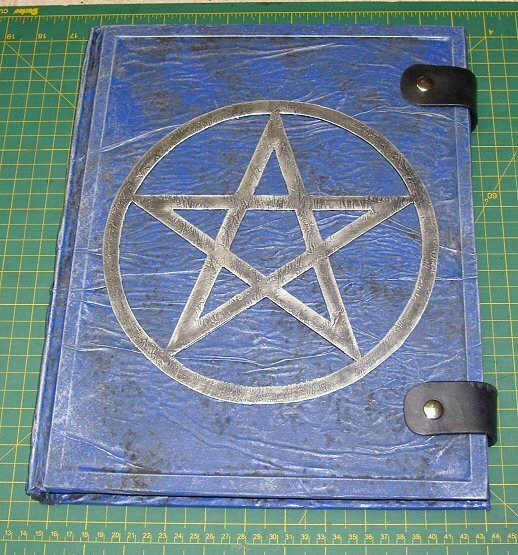 After learning how to do the kraft paper and glue (or acrylic matte medium) technique for covering books, I posted about it on a few bookbinding and prop forums. However, most of those forums and some websites I looked at equated it to a similar technique that seemed to be well known on those sites. 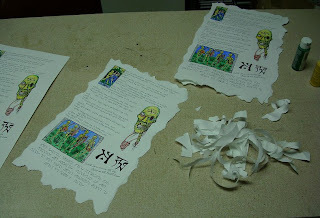 It uses Mod Podge (or white glue) and paper towels. I determined to see which gave the better results. For this book I used Mod Podge and multi-fold paper hand towels (the kind you find in public restrooms). I ripped the towels up into quarter sheets and glued them down, letting the edges overlap. 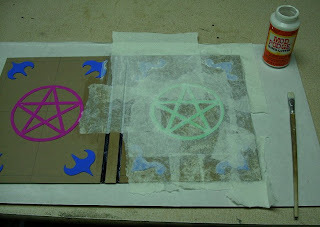 Once the paper and Mod Podge was dry, I gave the whole thing a base coat of black acrylic paint. Then I dry brushed one cover side with silver paint and the other with an antique gold paint, which looks more bronze than gold. I finished up with a coat or two of glossy clear sealer. 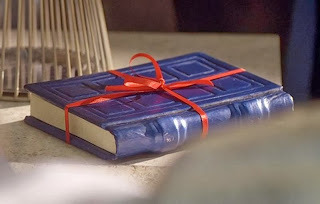 Because the book was designed to be opened from either side, I couldn't use a ribbon book mark, like I usually do. The spine always stays on the left. 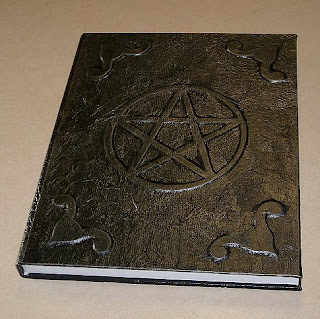 You just flip the book over (top over bottom) and the pentagram design reverses. Theoretically, as long as you only wrote on the right hand page and never on the left, you could use this book both backwards and forwards. 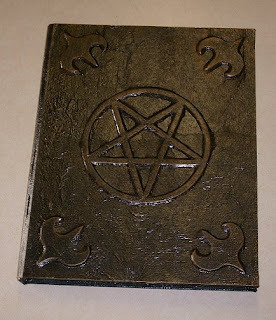 You could put your good spells in it with the upright pentagram facing front, and then flip it over and put your evil spells in it with the reversed pentagram facing front. Whichever kind of spells you were using would appear normal on the right hand side, and the others would appear upside down on the left hand side (until you turned it over and opened it from the correct side). The reversible aspect was a novelty. I don't know if I will make any more of them, unless I get a good response form my customers. As for the other experiments, I don't think I'll use either one of those again. I don't like the texture of the final product when using paper towels as a covering material. Also, Mod Podge is too expensive to use for large books like this. This book used too much of it. 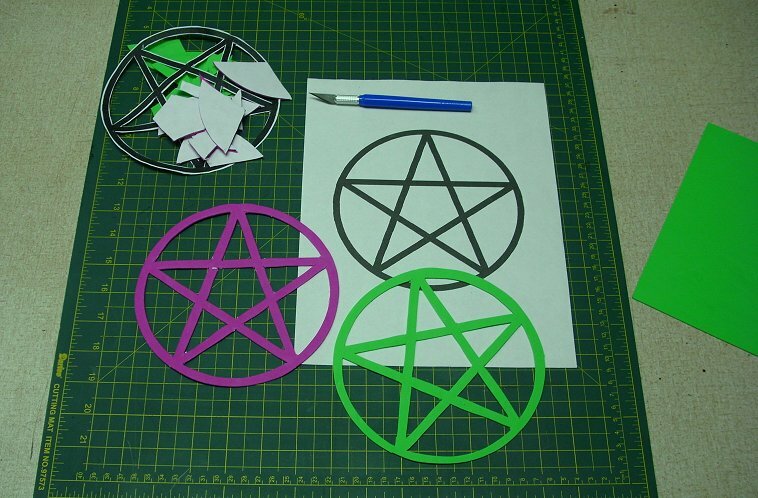 As for the foam sheets, They do work, and they are easy to cut, but they remain soft and squishy after covering with the paper and glue, and that softness makes the paper more prone to tearing even under normal use. I noticed some small tears starting to form already just from shelf wear and handling. For that reason, and because I was not terribly happy with the final product, I am selling it for a lower than usual price in my shop. 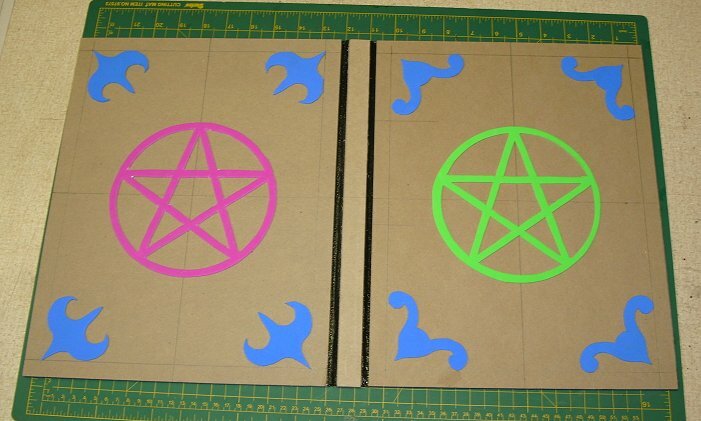 Back when I made the Vesica Pisces blank book of shadows for my friend, Lucy, I also made another of the same type and color. I left it unfinished for a long time, but finally finished it a few months ago. It is almost identical to the Vesica Pisces book, but with a pentagram on the cover and no silver hobnails on the spine edge of the cover. It also has black leather straps at the fore edge with snap closures, just like the Vesica Piscies. This book sold in my shop a few weeks after being finished. 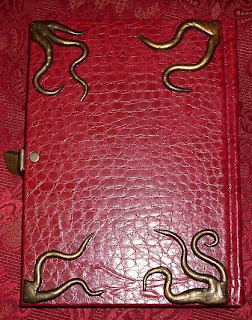 In another attempt to add product to the Rogue Cthulhu Prize Table this year, I made a small production run of Limited Edition Necronomicon Pages. 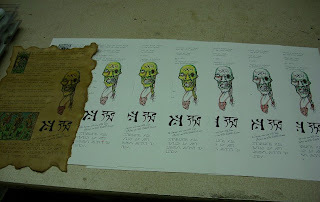 I thought I would share a little about that process with you. The Limited Edition pages are selected from my regular sets particularly for their artistic content. I have these pages blown up to 11x17in. from their usual 8.5x14in. 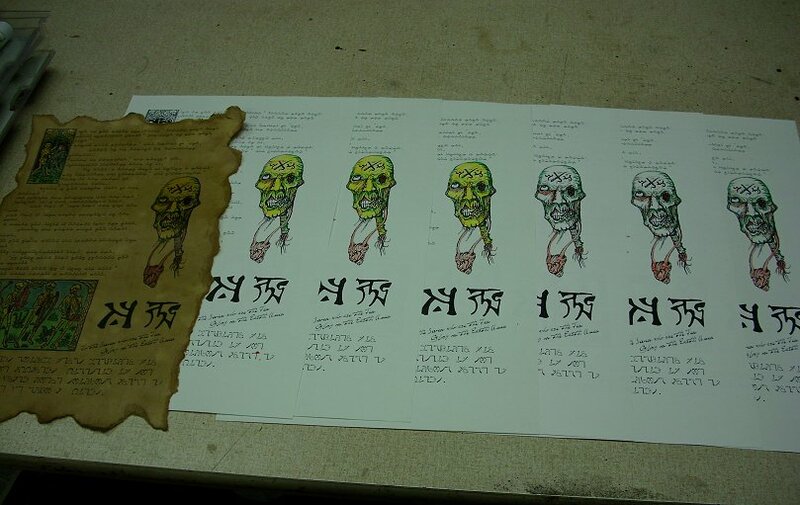 and I print them on heavy weight art paper. Then I go about painting the line art with acrylic paints. I only use red, green, blue and yellow to paint them. The limited pallet reminds me of an illuminated manuscript, especial in the woodcut designs, and gives it a medieval feel. For the creature line art, I water down the paint and layer it to get a good blended effect. I'm really a terrible painter. I just got lucky the first time I tried this and so now I use that first one as a template and try to reproduce the effect on all the others. After painting, I tear the edges of the paper off to give them character. Then I dye them with my paper aging solution (which is a mixture of instant coffee, black tea, black walnut crystal ink, and brown RIT dye). Finally, I coat it on both sides with polyurethane sealer to give it a leathery feel. I have a stack of some 15 or so encyclopedia re-cover projects that are half finished sitting in my workshop. 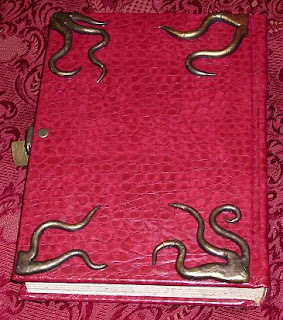 I needed to add some high end product to the Prize Table this year when Rogue Cthulhu went to Origins 2010, so I quickly finished up one of the items that had been sitting in limbo for several months. It is essentially very similar to one I did a year ago that I called "the 9th Gate", in honor of the movie that it reminds me of. 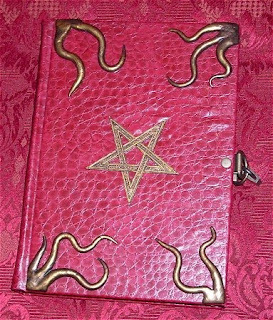 This edition has one unique feature (besides the red cover) that the other did not. 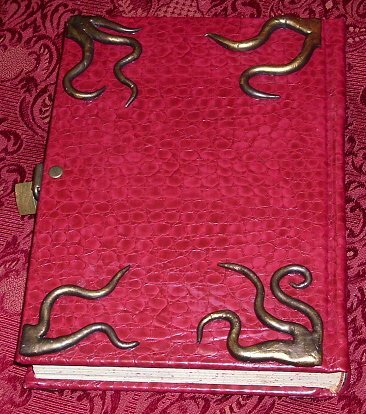 It has a very interesting red speckled pattern on the page edges that looks like blood spatter. Interestingly enough, I did not create this pattern. It was put there by the publishers of the New Standard Encyclopedia, from which this tome is made. I liked it so much that I decided to leave it as is and not repaint over it. As this was a bit of a rush job, I didn't do anything fancy with the end papers, or put in a book mark. 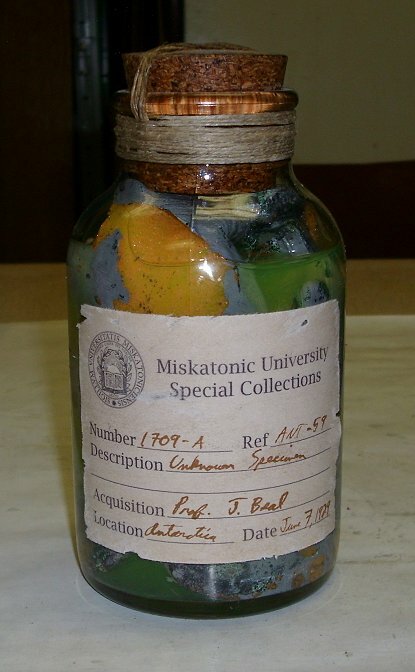 Still, it's a nice prop for a Vampire of Cthulhu larp game, or would make an interesting conversation piece. This book is currently for sale on eBay. 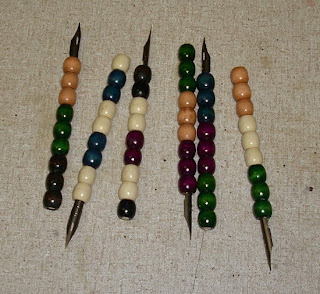 Now that I am back in my workshop, I thought I would start out with some new quill pens. A few months ago I noticed that I have been selling a lot more of the cheap feather pens than I was of my more complicated pens. So I started putting together more of the cheaper pens. 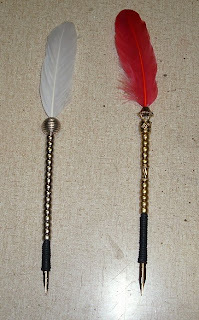 In addition to making simple feather pens, I put together these very simple pens that I can sell very cheap ($4 each). They are designed to be travel pens. 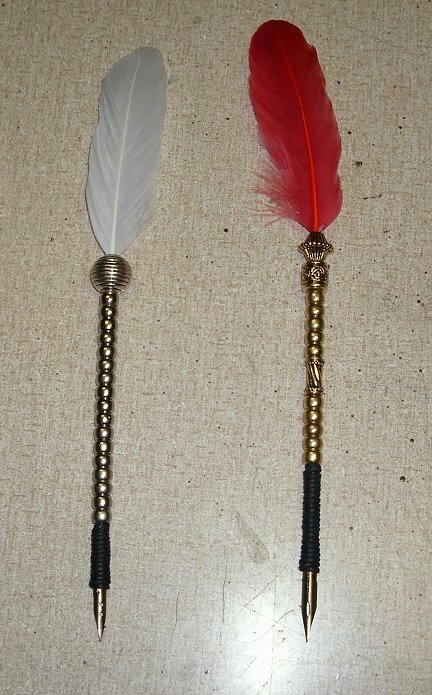 They are only about 5 inches long and they will fit nicely into a purse or travel kit. I also put together these sparkling new additions. I had to go through my ebay and etsy shops the other day and delete several pens I had listed there, as they have sold in my local shop, so I guess the wheels of commerce are turning, albeit slowly. A few months ago I posted about my first Thing in a Bottle project. 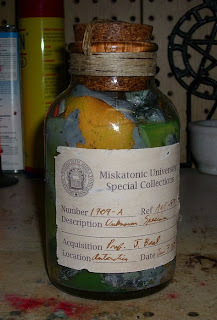 I was unhappy with the way it came out and planned to disassemble it and start over, however, I decided to add it to the Rogue Cthulhu prize table and see what happened to it. If it went, it would save me from having ot redo it. If not, i would eventually tear it apart and try again, someday. 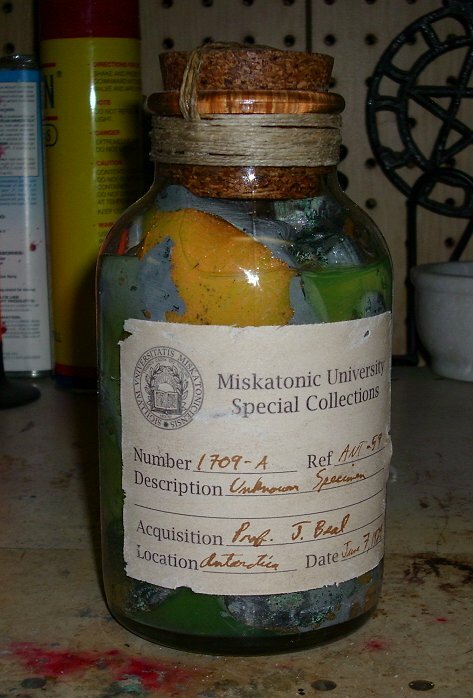 Before offering it up as a prize, I slapped a Miscatonic University label on it to make it look like a finished piece. i downloaded the label form one of my favorite sites, Propnomicon. 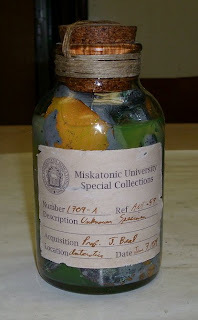 The label was stained with walnut ink, filled out with sepia ink and a quill pen, aged with sand paper, and adhered with white glue. As it turns out, it did not go to a player as a prize, but it caught the fancy of one of my Game Masters, who put in well over 36 hours of work at the show, both as a GM and with set up and tear down. I gave it to her as a thank you. OK, so it's been a while, but I'm back in the saddle again! My custody issues are over, and Origins is finally behind me, so I am finally back in the workshop getting back in the swing of things. Before I tackle editing and uploading all the images from my Black Duke project, I thought I would start out with some light lifting and post one of my recent projects from this year's Origins Game Fair. You may remember from previous posts that I have made several large set pieces for Origins. Namely The B.S.P. and Notorious B.I.C. This year my gaming group, Rogue Cthulhu, was given an exceptionally large room for our gaming needs. In a mad attempt to fill the space, I began working on additional set pieces. This is Igg. 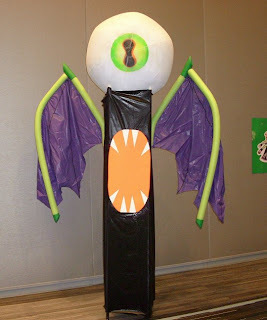 He is a giant flying eyeball. He was constructed from a 48" vinyl beach ball which was spray painted white and stenciled with an iris. The iris was also spray painted on. In order to keep the paint from sticking to itself while deflated, I dusted the whole thing with cornstarch. It worked, but was very messy. 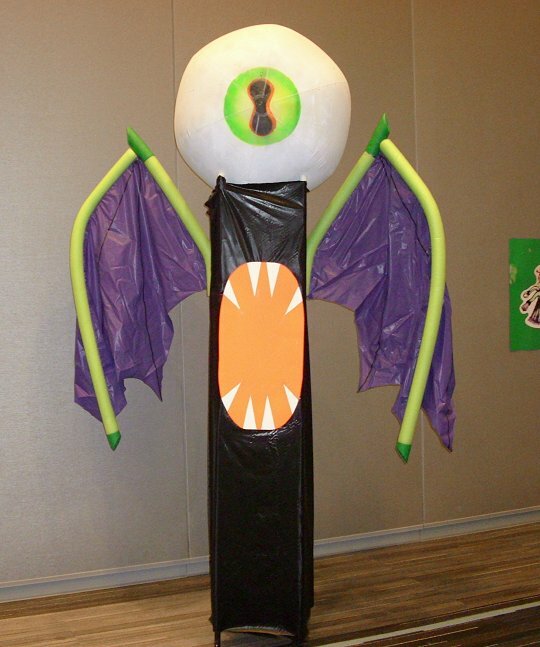 The eyeball was hoisted up onto a 6.5 foot tall framework of pvc pipe, which was draped with black plastic roll table cover. For a sense of scale, that wall of black plastic sheeting behind him is 8ft. tall. The mouth was made from florescent poster board and taped on place. 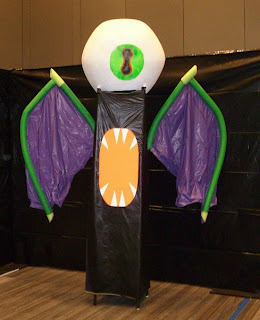 The wings were actually from a Cthulhu costume that I had started several years ago, but never finished. I swear that they looked better before transport. I think that they curved a little bit too much in the heat. They were made from foam pool noodles over a pvc frame. The membrane is more plastic roll table covering. The wings are two pieces, designed to be mounted onto a backpack for the costume. For this application, they were simply duck taped to the pvc frame holding up the eyeball. This is Oook. His twin brother. I whipped out a second pair of wings in just over a day for this project. I was very pressed for time and resources for this project. They don't look like much (and they aren't), but they filled up the space nicely, and they were only about $10 each to build. The drying time for the ball was the longest time factor. That took several days to get a nice white coat on them. Other than that, It took an hour or so to put together the mouths, and about a day for each pair of wings. I already had some pvc cut to 3ft. and 6in. lengths, so piecing together the frames was nothing at all. 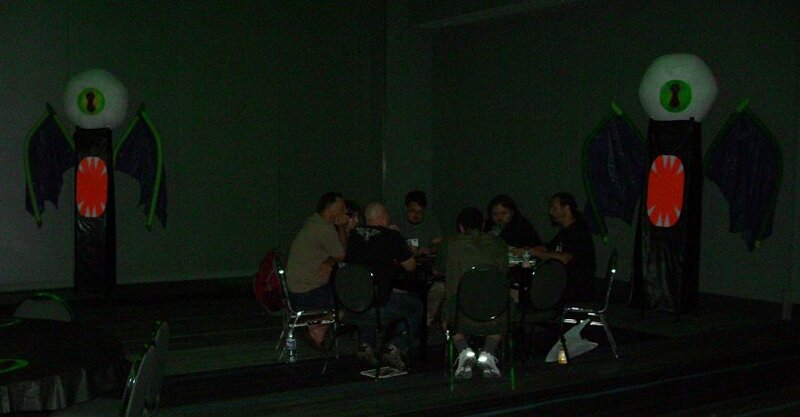 Here they are flanking a table of innocent gamers.